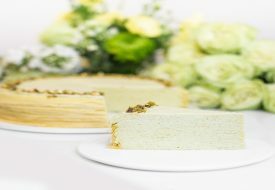 A new addition to Marina Bay Link Mall, Crystal Jade Prestige recently opened its doors. Positioning itself as a contemporary Chinese restaurant perfect for business luncheons, the 140-seater restaurant also comes equipped with private dining rooms to have corporate meetings in. That’s not to say that families and friends can’t enjoy the food here too. Crystal Jade Prestige is the culmination of the brand’s expertise in Chinese cuisine, having spent 20 years perfecting the art of Chinese cooking. Diners can look forward to their favourite dim sum dishes, Peking Duck and more. A decadently rich dish made with crispy Suckling Pig Skin and Black Truffle Rice. The Roasted Baby Suckling Pig rolled with Black Truffle Pearl Rice ($20/pc, $168/half or $328/whole) is a dish you won’t be able to find anywhere else. 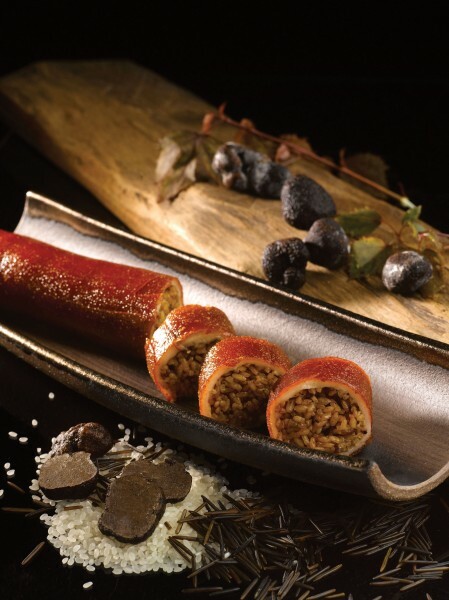 Japanese rice is infused with aromatic black truffle and rolled up with a crispy layer of suckling pig crackling. 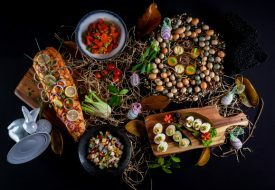 The decadent dish is heavy on the palette, but when paired with the spicy Thai apple salad the refreshing tanginess of the salad helps to cut through the richness of the truffle and pork. The Tea Smoked Roasted Duck takes a total of 30 hours to prepare. 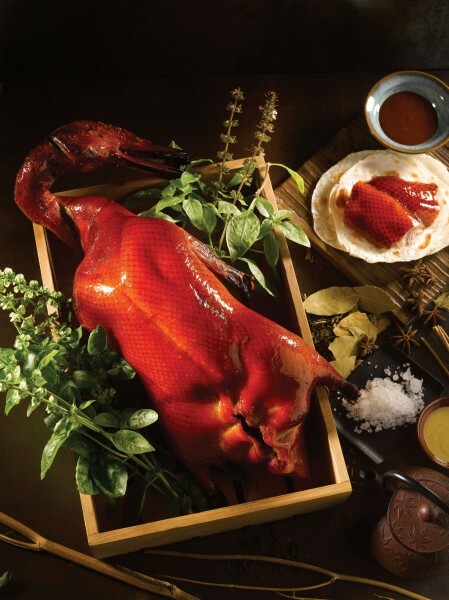 My favourite dish has to be the Tea Smoked Roasted Duck ($78/whole). What sets this Peking Duck apart is in the way it is prepared. The fowl is first marinated for 24 hours before it is smoked for six hours in a wok with Pu-er tea leaves and spices. This results in supple duck meat imbued with a smokey flavour and is similar in texture to ham. Glutinous rice stuffed with dried seafood and salted egg yolk. End the meal in true Chinese style with the Baked Crispy Glutinous Rice with Scallop ($12). 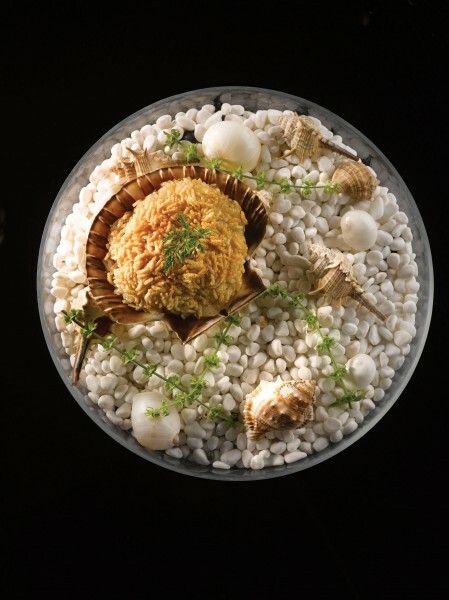 Elegantly served in a scallop shell, the chewy glutinous rice is mixed with dried scallop, dried shrimp, Chinese mushrooms and bits of salted egg before being baked. The crispy exterior and topping of puffed rice adds a crunch to the dish that compliments the moist and gooey interior. On top of the exclusive ala carte menu available at Crystal Jade Prestige, diners can also order dim sum during lunch. Crystal Jade Prestige does dim sum with a twist, serving deluxe creations like Pan-fried Siew Mai with Foie Gras Sauce ($12.80) and Steamed Dumpling with Shrimp and Black Garlic ($5.80/3pcs). 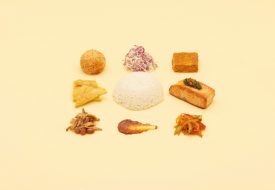 By experimenting with ingredients that are not usually found in Chinese cuisine like Foie Gras and Black Truffle, most of the dishes I tried to be on the heavier on the palette. However, its innovative approach to Chinese cuisine sets Crystal Jade Prestige apart as a premium Chinese restaurant to visit when looking to indulge.